One of the greatest blessings of spring are babies and if you have goats on your homestead, you probably have kids running around this time of year. Goats are a terrific livestock choice for the small homestead as they can thrive on a relatively small patch of land, they are fun, social creatures, and they provide delicious and nutritious milk. Goat milk has 39% of the recommended vitamin A, compared with the 21% provided by cow milk. It has 68% of the recommended B1, compared to the 45% we receive from cow milk. It is also slightly lower in cholesterol. As with everything else you produce yourself, goat milk produced on your homestead is healthier than the dairy you generally purchase from the grocery store. When you know what you put into the animal, you know what is—or more importantly, isn’t—in the milk. The control that is available to you as a producer compared to when you are simply a consumer is one of the best reasons I know to produce your own food. Because my family enjoys goat milk, and because of the health benefits it offers, I have looked for ways to extend the milking season. Because of the possible negative effects of not breeding does annually, I choose not to just leave a doe or two in milk indefinitely. I have found the best way to extend the production of milk is to stagger breedings. A doe needs a dry period of about two months before being bred so I stagger breedings to accommodate those dry periods. The kids are weaned from receiving milk at eight to twelve weeks of age and I maintain a regular milking schedule. This has been enough to keep us in goat milk year-round. Of course, there are more things you can do with goat milk than just drinking it. Instead of dedicating a freezer to goat milk, I have discovered some great storage ideas and recipes. Here are a few of my favorites. Evaporated Milk: Fresh milk is delicious and can be frozen with minimal change in taste. But there are some situations, from camping trips to power outages, when shelf-stable milk is extremely convenient. Evaporated milk is fresh, homogenized milk from which 60% of the water has been removed. Canned milk can be stored at room temperature until opened, after which it needs to be refrigerated. According to The Food Lover’s Companion by Sharon Herbst, when evaporated milk is slightly frozen, it can even be whipped and used as an inexpensive substitute for whipped cream. Making evaporated milk is as simple as boiling milk. Bring four cups of goat milk to a slow boil on medium-high heat. Boil, stirring constantly, until milk has reduced in volume by a little over half. Pour milk into sterilized canning jars and seal with sterile lids and rings. Process in a boiling water bath for ten minutes. Transfer to a folded towel on the counter and leave undisturbed until the jars seal. Keep in a cool, dark place for up to one year. Sweetened Condensed Milk: Sweetened condensed milk is a mixture of whole milk and sugar. Sweetened condensed milk is used in baked goods such as candies, puddings, and pies. It can be unopened sweetened condensed milk at room temperature for up to six months. To make your own sweetened condensed milk, combine four cups of goat milk with two cups of sugar in a heavy-bottomed pan. Cook, stirring constantly, until mixture reduces by slightly more than half. This product will be very thick and sticky at this point. Pour mixture into sterilized canning jars. Seal with sterile lids and rings. Process in a boiling water bath for ten minutes. Transfer to a folded towel on the counter and leave undisturbed until the jars seal. 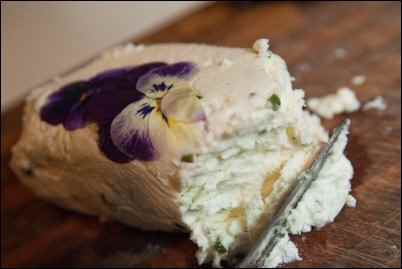 Easy Goat Cheese: Goat cheese, or chevre, is enjoying a rise in popularity with foodies everywhere. It is very simple to make your own goat cheese at home, which is fortunate because with increased popularity comes increased prices. To make your own goat cheese, slowly heat two quarts of goat milk in a non-reactive pot to 180-185F. Add half a cup of the warmed milk to one cup of sour cream, stirring to blend. Add this mixture back into your pot of milk. Remember, the whey that you have drained off the cheese is also very nutritious. You can add it to soups, smoothies, and baked goods. Cajeta (Mexican Caramel Sauce): Cajeta (pronounced cah-Het-tah) is a caramel sauce I was first introduced to when I worked in Mexico. It was most often put on toasted bolillos (hard rolls) and eaten for an early breakfast. Toast is just one of the ways to enjoy cajeta. Eat it with fresh fruit, in oatmeal, as a topping on store-bought ice cream, or incorporated into your own homemade ice cream or yogurt. Cajeta is an excellent way to use goat milk, especially if you have so much you don’t know how you will use it all, as one quart of goat milk will make one pint of caramel sauce. I have yet to meet anyone who does not love the rich, creamy sauce. It is a terrific item to have stashed back on your shelf, and it makes an unusual and thoughtful gift. To make cajeta, you need one quart of goat milk, one cup of sugar, ¼ teaspoon of baking soda, and 1 ½ tablespoons of cornstarch. Stir the baking soda and cornstarch into a small amount of the milk. Put the remaining milk into a heavy-bottomed pan with the sugar. Heat until the sugar dissolves and add the reserved milk. Bring to a boil over medium-high heat, stirring constantly. Adjust the heat as needed to maintain a steady boil but do not allow mixture to boil over. Continue boiling until mixture begins to take on a caramel color. It is extremely important to stir constantly at this point because the sauce is thickening and can easily stick to the bottom of pan and burn. It takes approximately forty-five minutes from when the milk begins to boil to when it begins to turn a caramel color. At this point you can stop cooking the sauce whenever you are happy with the consistency. Cajeta can be thin, so you can pour it, or thicker, like a candy coating. The sauce will thicken slightly as it cools. To can a large batch of cajeta, pour finished product into sterilized canning jars and seal with sterilized lids and rings. Cover with a towel and leave undisturbed until you hear the jars seal. Store any jars that did not seal in the refrigerator. Glorias (Caramel-pecan Candies): Glorias offer another authentic taste of Mexico. They are special treats that make a beautiful small gift for any special occasion. They are a traditional Christmas gift in many parts of Mexico. This recipe makes approximately fifteen candies. To make Glorias you need to make your caramel first. Combine four cups of goat milk, 2 ½ cups of sugar, and three tablespoons corn syrup into a pan and cook over medium-high heat, stirring constantly, until mixture begins to bubble. Add ½ teaspoon baking soda. Continue cooking until mixture turns a caramel color and you can see the bottom of the pan, or until mixture reaches 240F on a candy thermometer. Remove your caramel from the heat and add two teaspoons of vanilla extract. Let caramel cool until you can work with it using your hands. Meanwhile, toast ten whole pecans in a dry skillet over medium heat. Roll caramel into tube shapes. Top with a pecan and wrap in parchment paper. 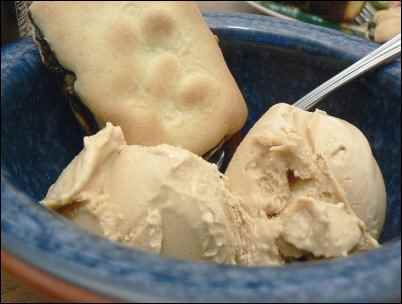 Goat Milk Ice Cream: Goat milk ice cream takes a little time and prep work but once you taste this custard-style ice cream you will agree it is well worth the effort. The main difference between ice cream made with goat milk and ice cream made with cow milk is the cream. Because goat milk is naturally homogenized, you need to find a replacement for the cream. Luckily, you can do this by adding a small amount of fresh goat cheese and powdered goat milk. Don’t have powdered goat milk on hand? No problem; regular powdered milk will work just fine. This recipe will make slightly less than a quart of ice cream. First, you need to whisk three whole eggs. For an even creamier custard, you can use six egg yolks. Just remember to save the egg whites for another meal. Set whisked eggs aside. Warm approximately three ounces of fresh goat cheese and whisk until smooth. Set aside. Combine two cups of fresh goat milk and one tablespoon of corn syrup in a pan. Heat until it begins to simmer. Add ¾ cup sugar, six tablespoons of the powdered milk, and a pinch of salt to the hot milk. Whisk until there are no lumps and everything is dissolved. Remove from heat. Temper the eggs by slowly adding one cup of the hot milk into the eggs you have set aside while whisking. Pour egg mixture back into the saucepan, continuing to stir. Put pan back on medium-high heat and cook, stirring constantly, until mixture thickens. Remove from heat. Add one cup of the hot custard to your softened goat cheese. Stir until combined. Pour cheese mixture back into the pan and combine well. Strain mixture into a large bowl and cool overnight in the refrigerator. Add two teaspoons of vanilla extract and churn in your ice cream maker according to the manufacturer’s directions. Stir in ½ cup of any desired add-ins, such as fruit, nuts, or chocolate chips. Enjoy! Goat Milk Hand Lotion: Goat milk is not just for drinking. Milk contains alpha hydroxy acids which have proven benefits for your skin. Milk also contains protein, nourishing oils, and vitamins A and D. Goat milk lotion is a great item to have on hand, especially for those of us who spend time outside working with our hands. To make a small batch of lotion that you can keep in the refrigerator you need one cup of goat milk, two tablespoons good-quality oil, 1/8 teaspoon white vinegar. Mix the milk and oil thoroughly. Add the vinegar, which acts as a preservative, and blend well. If you want to make a longer lasting lotion, whether to give as gifts or sell, you only need a few more ingredients. Melt 1 ½ tablespoons of beeswax with ½ cup of a high-quality oil, such as olive oil or sweet almond oil. Add five to ten drops of an essential oil of your choosing and one cup of goat milk. Add a few drops of vitamin E, which is good for the skin and acts as a preservative. Stir until mixture becomes thick and creamy. Store in a sealed container in the refrigerator. Goats are friendly animals to have on your homestead. The milk they provide is a great benefit to those of us who are trying to wean ourselves off of the consumer-based lifestyle and into the producer-based mindset. Most of the recipes I have provided give you a jumping off point to develop your own, based on the likes and needs of you and your family. I have thoroughly enjoyed testing new ways to use the plentiful supply of milk we have and even when the recipes don’t turn out exactly how I envisioned them, they are still delicious. The added benefit of feeding your family something you know has been produced with the utmost care is the most rewarding of all. Happy milking!